Check out this article written by the rangers at the National Park Service's Alaska Public Lands Information Center, where I did weekly animal outreaches during the summers of 2009 and 2010. Always a highlight of my week! Learn about and meet Alaskan Zoo Animals! Join Lisa from the Alaska Zoo for a program featuring live Alaskan animals. Lisa will discuss the life and biology of each featured animal. She will also speak about the importance of zoos in this time of dwindling wildlife populations. Past animals have included a red fox, a porcupine, moose, musk ox, wolf pups, a sea otter, and many more! 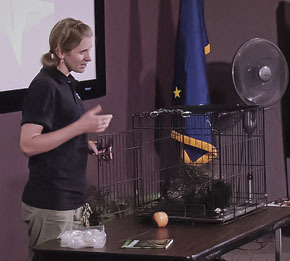 Lisa Chickos is an animal trainer and the Outreach Coordinator for the Alaska Zoo. She currently works with the Zoo's red foxes, porcupines, owls, muskrats, magpies, mountain goats, raccoons, and reptiles. It's mission is "to promote the conservation of arctic, sub-arctic and like-climate species through education, research and community enrichment." The Alaska Zoo is proactive in its conservation efforts and research, as well as, education programs. The Zoo is a part of the Species Survival Program for tigers and snow leopards, and the Polar Bear International helping with the conservation of polar bears. Also, the Zoo is involved in animal husbandry and research on a variety of scales in part with the University of Alaska Anchorage. For more information visit www.alaskazoo.org.